On board the Tapas Bus you will enjoy a unique experience that combines the culture and history of Madrid with its local gastronomy, while you comfortably ride along the streets and key places of the city guided by our expert professional guide. Let us take you through a tasting trip of the different specialities that locals love to have for breakfast, tapas lunch or our special cocktail dinner. 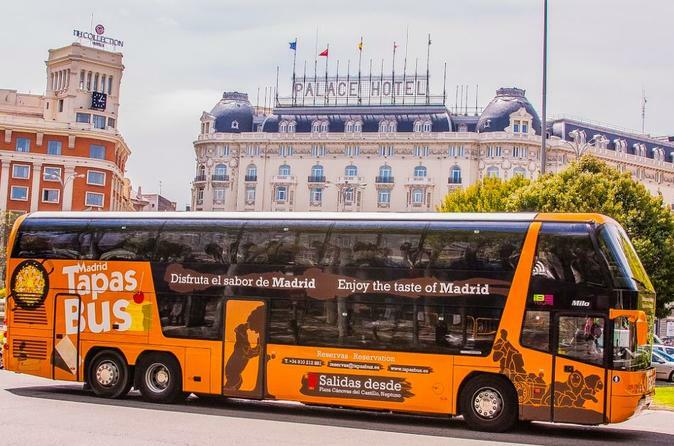 On board the Tapas Bus, you will be able to enjoy, choosing from breakfast, tapas or dinner time, how you want to enjoy the best views of Madrid, with a panoramic guided tour of all the key places in Madrid that you can’t miss. You only need to choose if you want the famous local breakfast with churros and warm chocolate or coffee in the morning, a tasting of the local Spanish tapas between 10am and early dinner time, or a fancier cocktail dinner in the evening surrounded by the streetlights of a city with an inspiring night life.